The following is the second of a three-part blog series on dynamic content management through IWCO Direct 1to1. Read part one here. Part three will close the series on Friday, November 16. Marketers know that highly personalized offers using variable creative layouts and content (text and images) are the most direct route to acquiring new customers for products or creating members for loyalty and other continuity programs and services. Today’s consumers, especially millennials and Gen X buyers, respond to effective personalization and will shun brands who annoy them with clunky attempts to “identify.” I’ll repeat myself (at least) one more time—this means marketers need a platform that delivers unified marketing communications across multiple channels with accuracy and timeliness. As you’ll read in our upcoming DCM white paper, print continues to be one of the most effective direct marketing channels, and personalized messaging strengthens the impact a printed piece can have. In fact, one study shows that when content is personalized, targeted, and relevant, response rates increase by 500%. Automation to accurately update these elements in real time, using established business rules and targeting. The challenge in creating a personalized customer experience is compounded when multiple approvals are needed to ensure compliance, awareness, and effectiveness. In other words, it’s not just making sure artwork is approved and copy has been proofread. Approvals from legal, call center staff, and finance may also be required and must happen simultaneously to maintain deadlines and ensure the timeliness of the offer, especially when it’s part of an omnichannel campaign. Part of the magic of IWCO Direct 1to1 is being able to provide a secure yet distributed central platform where all reviews, approvals, and tracking needs are managed. This is proven to shorten the approval process and increase speed to market—which is critical in today’s environment of programmatic offers and trigger campaigns. The magic was experienced by one of our clients in the healthcare industry who is now using IWCO Direct 1to1 for their campaigns. 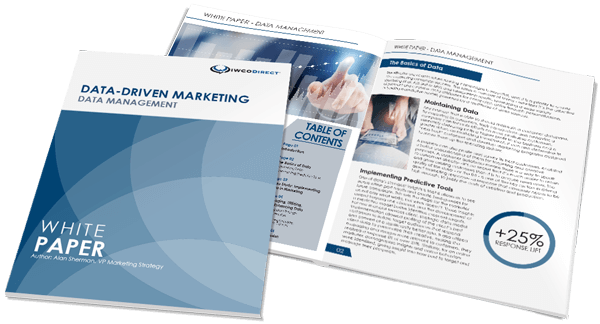 This client had multiple letter versions and complex business rules and logic to create highly personalized and confidential healthcare and plan information for their campaigns. The highly sensitive nature of the information and need to strictly maintain HIPAA compliance resulted in a high level of extra upstream processing and stringent proofing to prepare each version for print production. As if the challenge wasn’t great enough, the “degree of difficulty” was increased by timing constraints for updates. The implementation of IWCO Direct 1to1 enabled the client to create and manage all of their own letter versioning and business rules while reducing their manual work effort. The platform replaced the previously intensive update process with an automated system that allows one change to be made across multiple plan versions, eliminating the need to update each version individually. The result? Reduced cycle time, reduced agency and production alteration costs, with changes made later in the cycle so all personalized plan and sensitive health information is accurate and meets all HIPAA and other healthcare industry requirements. Stop back on Friday to read my third and final installment of this series. If you’d like to receive a copy of the white paper as soon as it becomes available, drop me a note here.